Two young Romanians have discovered a revolutionary solution aiming to help improve companies problem management and act as a visual management system in factories. Back in 2014 Paul Harfas, a graduate of the School of Electronics and Telecommunications in the Timisoara Polytechnical University along with Felix Blaga, having graduated Automations in Timisoara and also holding a Master’s Degree from the Danish Technical University, came up with the idea of Production Efficiency Trackers or P.E.T. It took them two years to set up Octavic, a company based in Oradea, Western Romania, which in their opinion, is the response to the problems they have observed in production facilities everywhere. P.E.T. is a system providing visual management in factories which helps improve prioritisation and problem management, also standing for almighty monitoring eye over the production facilities around the country and worldwide. The company has developed it on both hardware and software components in its headquarters. ”Our background is based on developing hardware and software for industry, project management and product. Moreover, Felix has attended an economics university,” Harfas said. Since their beginning back in 2016 they have worked with the Technical University of Denmark to develop the system and their main objective is to provide Industry 4.0 solutions and help production organizations streamline their processes. ”More specifically, it addresses the lack of information on production cycle times and the typologies of defects observed in the automotive electronics and plastics industry,” Harfas clarified. In August 2017 the company ranked among the last 20 of a total of 1,200 companies having enrolled in Ikea Bootcamp’s Acceleration/Innovation Program in partnership with Rainmaking. ”Unfortunately we were not among the top 10 which made it into the program,” Harfas said. Octavic had 9 employees one year later of which seven were involved in production and engineering and two in marketing and sales. The company offers an IT hardware and software system providing real-time visibility and transparency on operations and problems in the production areas. ”The system supports all levels of a manufacturing workflows from operators, chief engineers, maintenance, planning, production management to industrial performance and general management, providing real-time visual management, reports and KPI relevant, and real-time alerts on issues in the shopfloor. The system is also a basic tool in supporting the improvement methodologies in the Lean, Six Sigma paradigms. For example, in Pharma, due to the visibility it gained from the implementation of the system and the statistics provided, an improvement in OEE (Total Equipment Effectiveness) of 5-8 percent was achieved,” Harfas explains. 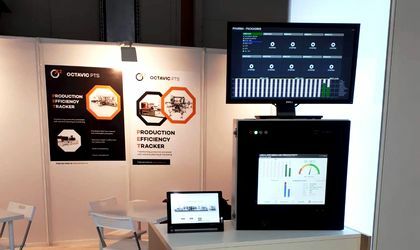 Octavic continues to expand rapidly internationally as they are offering not just a system, but also active help on how to use it to achieve results – they provide an adaptive hardware and annotation flow depending on the process, as well as fast installation, including the Industrial IoT part. Even if it was initially designed for Pharma, Automotive and Food & Beverage industries, P.E.T. can be implemented on any production line. It is easily adaptable to any industry and any manufacturing particular needs so their client list, which included Zentiva and Gedeon-Richter Targu-Mures, also added companies like Plexus Oradea (EMS – electronics manufacturing), Scanjet-Ariston Norway/Sweden (naval/marine equipment) and Sennet Controls and Pro-Air GmbH Germany (both in industrial process control). Octavic recently opened local branches in Copenhagen, Denmark and Poznan, Poland. ”Our strategy is to find local partners, system integrators. At the moment we’re mainly targeting the Pharma industry and wider packaging in other areas (Detergents/ Soaps, Cosmetics, Lathes, Drinks, Foods),” Harfas said. According to him, we are now in a period similar to the ’90s when all companies adopted ERPs and CRMs or Warehouse Management Systems. Nowadays, the gap between warehouse raw materials and warehouse shipping is growing on the scale of warehouse shipments that provide the same real-time visibility and digitisation of shopfloor processes in the production hall where the value is actually added in production. The startup was admitted in a hardware startup program co-funded by the Polish state which also included three US companies, one from Canada and one from India. 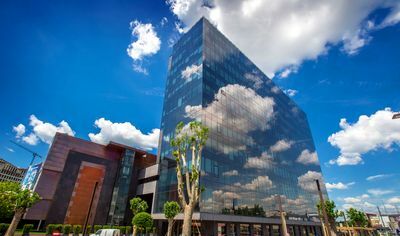 Poland has a budget of EUR 25 billion to attract and finance startups in hardware and software with one basic requirement: Innovation, a product that is ready to be put into production, validated on the market and eligible to be funded by Venture Capitals. The main promoter of this program is Brinc, one of the world’s largest hardware accelerators, with programs developed in Hong Kong, Shenzen, Bahrain, Barcelona and recently in Poznan, Poland. Since 2014 the accelerator has been investing in IoT & Connected Hardware launches. In other words, it is an ultra-hands-on hardware accelerator that supports entrepreneurs aiming to unlock the potential of consumer electronics products, IoT, Industrial IoT, SaaS and Big Data through connected solutions. These include USD 65,000 equity-free financing and spending up to 2 weeks in Hong Kong and Shenzhen, where they will learn about production, prepare for the mass production and visit prominent local factories. Brinc will also provide at least 5 Polish-based German companies to provide further funding and create a basis for rapid prototyping in Poznan. ”Following the Brinc’s Poland program, Octavic plans to develop a global presence by implementing the system in manufacturing companies to help them manage real-time production operations in order to be more productive in a simple and smart way,” the company’s founders added.